This time, Neil Liffen, director of East Coast Physio Ltd (ECP) discusses the wrist anatomy with particular emphasis on the back of the hand and common sites of tenosynovitis. In completing a BSc Physiotherapy and MSc Diagnostic Musculoskeletal Ultrasound, Neil has always been fascinated by the human anatomy and learning ligaments, tendons, muscles etc. An example, of the complexity of our anatomy can be demonstrated at the dorsal wrist (back of your hand). Commonly, the dorsal wrist has twelve tendons, divided into six compartments, with some compartments crossing over each other. 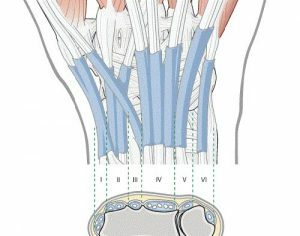 The extensor tendon compartments are anatomical tunnels on the dorsal wrist and these tendons allow you to predominantly extend (lift up your fingers). The extensor tendons are held in place by the extensor retinaculum. As the tendons travel over the posterior (back) aspect of the wrist they are enclosed within synovial tendon sheaths. These sheaths reduce the friction to the extensor tendons as they traverse the compartments that are formed by the attachments of the extensor retinaculum to the distal (far end) of the radius and ulna. The wrist is prone to injury, commonly due to trauma, repetitive strain injury and/or through inflammatory conditions, such as rheumatoid arthritis and can cause tenosynovitis. Tenosynovitis is the inflammation of the fluid-filled tendon sheath (called the synovium) that surrounds a tendon, typically leading to joint pain, swelling, and stiffness. Any of the dorsal compartments of the wrist can develop tenosynovitis. The first compartment is the most frequently affected site, called De Quervain’s disease. The other two most commonly injured are the sixth (extensor carpi ulnaris – Figure 2) and second (intersection syndrome) compartments. In the majority of cases your symptoms will settle within normal healing times of 6-12 weeks. Due to the complexity of the structures at the wrist diagnosis from physical examination can be challenging. Occasionally, it is necessary to perform investigations and ultrasound is a useful early investigation in ruling in or out tenosynovitis and/or other pathology. If you would like further information on diagnosis, treatment and/or management please contact Neil Liffen. Neil Liffen currently combines his working week as an Extended Scope Physiotherapist and as a Musculoskeletal Diagnostic Sonographer. He combines working at East Coast Physio, with performing diagnostic ultrasound for several radiology departments based in NHS hospitals. Therefore, he has vast experience in performing ultrasound on tenosynovitis and treatment, including injections. Figure 1. The extensor compartments of the wrist. Figure 2. Tenosynovitis of the sixth extensor compartment (extensor carpi ulnaris).